Each year, first-year high school students at Frankfort–Elberta High School and Benzie Central read Bruce Catton’s Waiting for the Morning Train and create their own reminiscence of growing up in Benzie County. Mason Loney submitted this essay to the Bruce Catton Awards contest in 2013. Mason, now a 16-year-old sophomore, is the son of David and Kate Loney of Benzonia, the sixth child of eight. He is a challenging opponent on the basketball court as well as the football field. Mason is proud of his family’s long history in the area, including his grandfather, Max Loney, who maintained a turkey farm with his brothers. Max was personally invited by Eleanor Roosevelt to deliver one of his turkeys to the White House to be used for a presidential holiday meal, which he was happy to do. This was the biggest game of the year. It was the game that would decide who was the best in the conference. We all knew that it would be hard to keep our mouths shut during the game. It was against Glen Lake at our gym. I remember running out onto the court. I was so nervous. I mean, I was a freshman playing with the varsity. The stands were packed. You could feel the vibration from the yelling and the feet pounding. It was time for the start of the game. Jump ball, David versus O’Brian, we lost the jump. We came out with amazing defense. At halftime, O’Brian only had seven points. That was a huge part of the game. I mean, O’Brian was known as the best player in our conference. He usually would have twenty points against any other team at this point. We started the third quarter. It was a very bad third quarter for us. We haven’t had a good third quarter in a game yet and tonight was not our night. I’m pretty sure we were down by at least twelve points at the end of the third. Now everyone was scared. We worked as a team and in the final seconds, we brought the game back. I’m not sure what the score was, but we were down by one with twenty seconds on the clock. The crowd was crazy; the student section was crazy. Everyone was nervous; the bench held arms together. The ball was loose on our side. Everyone dove on it. I don’t know how this happened. Some people would call it luck, but the ball rolled right into Connor Bradley’s hands and he got a wide open layup. Seven seconds were left on the clock. We were up by one. They inbounded the ball and drove it down. O’Brian had an open three. He missed it. We couldn’t believe it. We won the game. Everyone swarmed the court. Cole Hollenbeck and I couldn’t believe it. We are freshmen and won our conference. Our team was so happy. Glen Lake wouldn’t even shake our hands. They went straight to their locker room. When Stapes [principal and coach Matt Stapleton] saw that, he got our whole team to go in their locker room and tell them, “Good job.” That probably wasn’t a good idea. I mean, our whole team was laughing and having fun, and they were getting yelled at by their coach when we came in the locker room. Yet it was low on every level for Glen Lake to do that. Anyway, we came back out and the crowd started cheering again. Then our head coach, [Reggie] Manville, told us to go in our locker room. We were so happy! It was the best feeling in the world, screaming so loud, hugging everyone we saw. We all sat down in the locker room: total silence. Manville said, “We’re back!! !” We all pounded on the lockers. Manville said one more thing to us and it was probably the nicest thing anyone has said. He said, “That was the best basketball game ever to be played on this court.” It doesn’t sound like a lot but it meant so much to the team. Our record at the end of that game was 10–0. We haven’t lost a game yet. 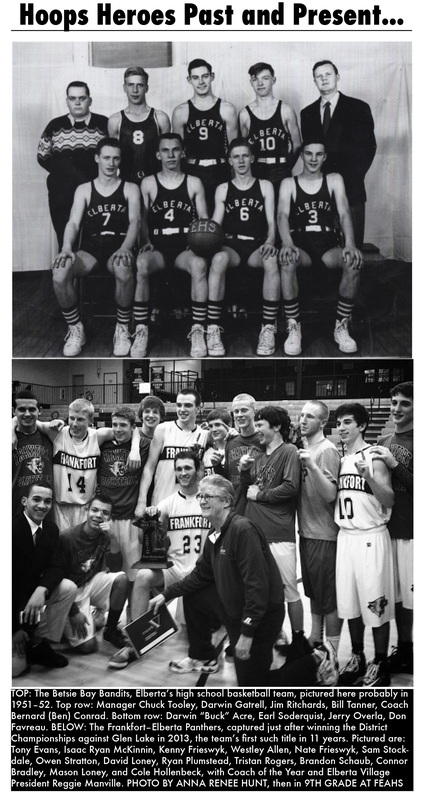 People don’t think little ol’ Frankfort is good at any sports besides football, but I’m pretty sure we made it clear that basketball is our sport too. The night of that win was the best night. Everyone in the community was proud of the Frankfort boys. It felt so good, knowing that everyone is proud of you, knowing that you have fans that come and support you when you are only a freshman. When you know the community is proud of you, it feels like nothing can stop you. Nothing brings excitement like hoops a step-up from Special-O! Be it 1950 or 2013. No dunks isn’t basketball. Maybe Coach Manville should focus more on Elberta, instead of panther pride’s quest to exist for a sporting family tree not worth the taxes.